We would like to inform that in the interest of the environment and comfort of our customers, we have introduced the e-invoice system. After activation of this service, all sales invoices, adjustments and advance payments will be available online in customer’s panel. 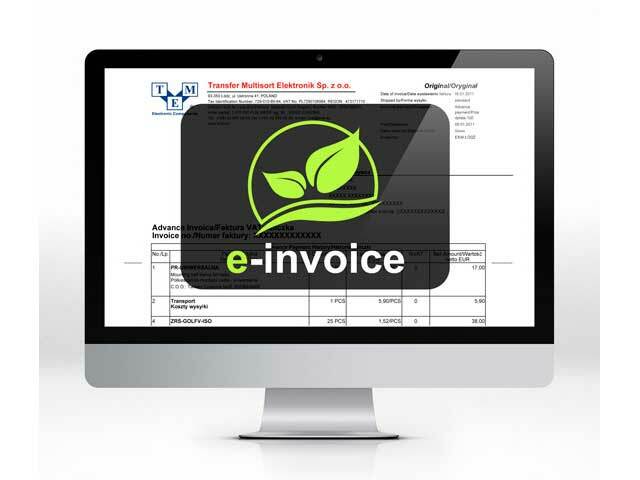 Each time after the purchase at TME, the customer will receive an email with a link to the e-invoice in the pdf format. The functionality is available for all TME Sp. z o.o. customers from European Union (except for Italian customers not having VAT EU). All the above mentioned customers have the possibility to download e-invoices in the pdf format from the www.tme.eu website. More information on how to activate and download e-invoice is available in Help tag.